Our charming Oregon Coast town is a premier destination for corporate meetings, dream weddings, team building, holiday parties and more. Our oceanfront banquet room offers floor to ceiling views of the picturesque Cape Kiwanda and Haystack Rock. Our beach space is the perfect space to host a beach wedding ceremony or a team building game of dodgeball. The beachfront venue and breathtaking views are sure to make your event memorable. Located just steps away from the beach, you and your guests can listen to the roar of the ocean, watch the surfers tame the waves or take in a breathtaking sunset silhouetting Haystack Rock. For the adventurers in your group, a climb up Cape Kiwanda or a kayak paddle in the Nestucca River are always an invigorating start to the day. Our professional event staff has planned just about every type of event imaginable, and we are here to help make your next event the most successful one you’ve ever planned. We look forward to hearing from you soon. Catering – From formal sit-down dinners to casual meet and greets, our award-winning culinary team will help you plan the perfect menu to meet your needs. Event Planning – There’s a lot more to planning an event than just planning the menu. We’re here to help connect you to other local businesses providing floral arrangements, sound systems, photographers, live entertainment and just about anything else you can dream up. Lodging – Pacific City offers most every style of accommodations imaginable. Ask about the new luxury hotel, 3-bedroom oceanfront cottages, charming ocean view boutique hotel, beach house vacation rentals and even the rentable Airstream trailers. PELICAN ROOM – A combination of the Outrigger Room and the Haystack Room, this is our largest event space and can handle a reception for up to 90 guests or meetings for up to 50 guests. 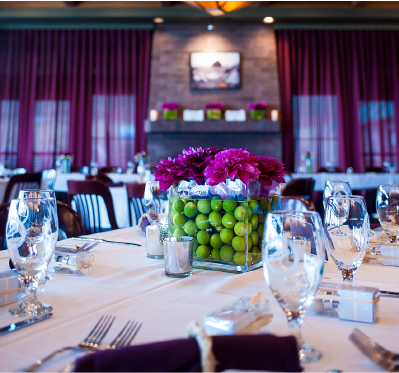 HAYSTACK ROOM – The Pelican Room can be sectioned off into two smaller event spaces. The beachfront Haystack Room includes a large gas fireplace and accommodates a banquet of up to 40 guests or meeting for 20 guests. OUTRIGGER ROOM – The remaining portion of the Pelican Room is our Outrigger Room. With beachfront access, this is ideal for business meetings and accommodates 20 guests. OUTDOOR PATIO & BEACH – Our outdoor patio and beachfront are adjacent to the Pelican Room and can be reserved for special events including picturesque wedding ceremonies on the beach. BARREL ROOM – Our Barrel Room, located just inside the brewery, is occasionally available for rental on a per-request basis. The stacked wood barrels and beer-essence atmosphere make this a fun location for cocktail receptions up to 30 guests.